Revenue in the Video-on-Demand segment amounts to US$14,828m in 2019. Revenue is expected to show an annual growth rate (CAGR 2019-2023) of 2.6%, resulting in a market volume of US$16,414m by 2023. The market's largest segment is Video Streaming (SVoD) with a market volume of US$11,420m in 2019. User penetration is 47.8% in 2019 and is expected to hit 48.7% by 2023. The average revenue per user (ARPU) currently amounts to US$91.37. Reading Support Revenue in the Video-on-Demand segment amounts to US$14,828m in 2019. Reading Support The Video-on-Demand segment is expected to show a revenue growth of 6.7% in 2020. Reading Support In the Video Streaming (SVoD) segment, the number of users is expected to amount to 130.7m by 2023. 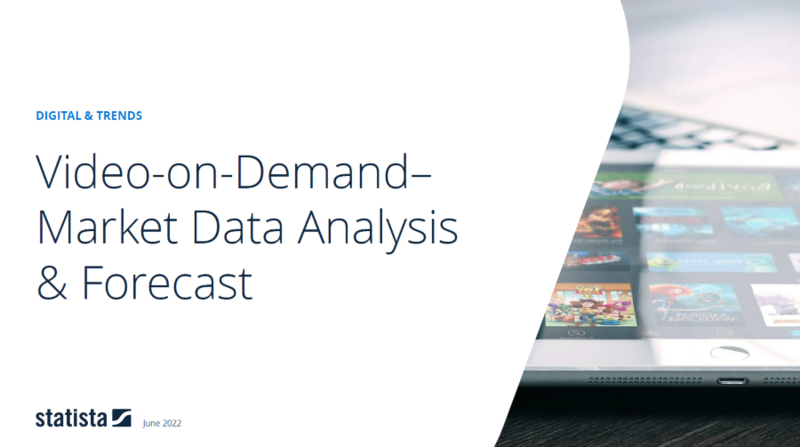 Reading Support User penetration in the Video-on-Demand segment is at 47.8% in 2019. Reading Support The average revenue per user (ARPU) in the Video Streaming (SVoD) segment amounts to US$91.37 in 2019. Reading Support With a market volume of US$14,828m in 2019, most revenue is generated in United States. Reading Support With a rate of 54.7%, the user penetration in the Video-on-Demand segment is highest in Slovenia. Here you can find more studies and statistics about "Video-on-Demand".